I finished this Sunday night 5/19-the first in a series of mudra-centered boards with collage and fabric and whatever is necessary. 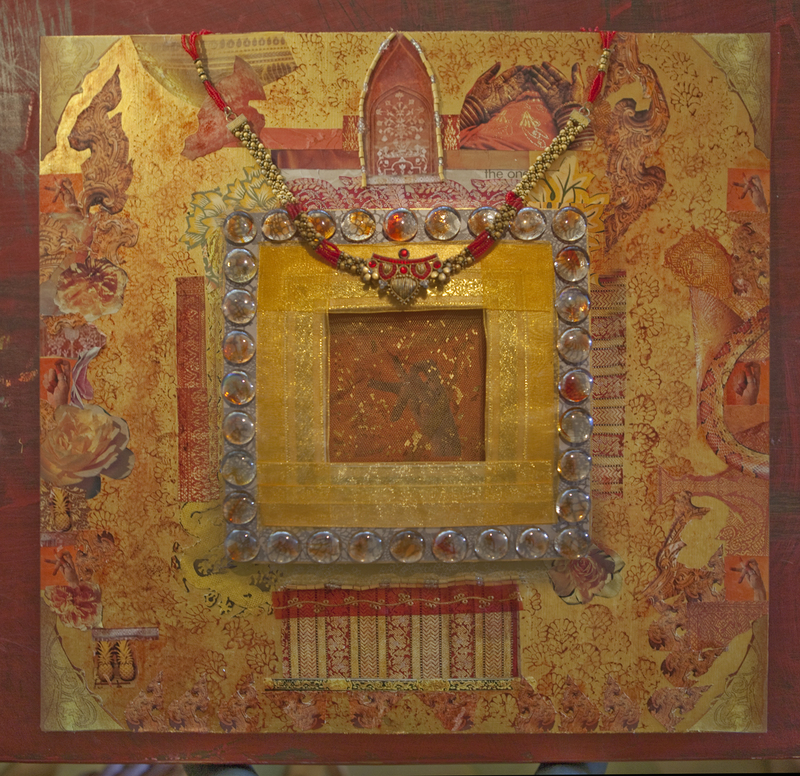 This one is kapittha mudra, on a gold-painted board with beads, ribbons, jewelry, paper and lots of glue. It is a hand gesture I’ve especially loved in Kathak dance. It can be Laxmi holding a flower, it can be pulling or draping. there are variations and many meanings but here it is by itself with no context and no movement. I wanted the mudra slightly hidden, veiled, as though it was in an Indian temple behind a curtain. I felt that gave it reverence. In dance they happen so fast. Now it is still and can mean what it means without movement. A lot took place doing this piece. It is probably the most complex artwork I’ve ever done and it represents years of seeking the right form to fill with my aesthetic. Years of becoming more conscious of what I require and what I desire in the visual world I want to see and experience and make. I want layers, gradations, integration and a sense of manifestation. I want above all beauty, and ornate beauty and yet simplicity and geometry. I want geometry and flow. And this piece is very fulfilling for me! I’m not used to being so happy with a creation! I learned so much during the process. The most significant thing I learned happened before I even started it – the planning. Sitting with my friend Kartika, we sorted through my box of beads and a big bag of fabric and we talked about possibilities. I left without my usual obsession. Because I’ve had to make art on top of other priorities (as so many artists) I came at it a bit compulsively. This piece required much measuring (a very maturing endeavor) and lots of experimenting – how do you make a frame out of ribbon, where do you cut? how do you flip an image so you can use it in all four corners, and on and on. I have learned to savor this process because it is devotional. It is surrender. It means you are willing to do whatever it takes to create it the way you want. Yet, I also saw at every step that planning and letting go are inseparable. The ONE thing I knew would happen in this piece is the one thing that got scrapped in the end: (at 4:30 Saturday afternoon to be exact) the little gold sculpey squares I spent hours making and baking and painting on my beautiful yellow cutting board, so carefully, in between so many other little jobs in the middle of life and work and vegetables and lentils and shopping and loving and dancing and shopping and working. On they went, off they went; will the rose get cut off by a square? Where will the snake go? Not sure where collage pieces even fit in, so to speak, I was struggling with the yummy gold babies, until a very PHYSICAL impulse to move freely with the paper images became the “more will be revealed” moment. It felt so good and as I worked the images in, they became integrated the way I wanted and I planned to put the squares on later. Later came and they were extraneous. They are sitting on the next board as we speak.